I started working in the music industry early on in my life as a percussionist/drummer, performing with many different groups from different musical genres that played many different styles of music. I enjoyed performing such a variety of music and this led to involvement in music composition, publishing, the recording industry, producing artists, and now music education. For the last 22 years I have lived and worked in the music industry in Tokyo, Japan. A large portion of my work involves using technology to produce music, TV, and Radio. A few years ago I was asked by Yokohama International School if I would be interested in helping them develop new ways of teaching using technology. It proved to be a very exciting offer for me to have some influence in the development of a modern arts program that introduced and developed skills currently needed to succeed in the entertainment industry. The use of technology in today’s multi billion dollar music industry is growing every day and musicians need a diverse skill set that includes using technology as well as (and in some cases instead of) becoming proficient at performing an instrument. I first met Patricia Riley in the spring of 2009. We were both presenting at a music conference in San Antonio that was hosted by the Technology Institute for Music Educators or TI:ME. She was presenting a project she had developed with a school in Mexico. In it they used skype (online conferencing software), the internet, and computers to link teachers in Vermont with a classroom in Mexico. They experimented with the possibiities of this medium and it’s usefulness in the field of education. This was an area that facinated me. A number of years ago I was asked to appear and perform in a short film produced by electronics giant Panasonic. In the film musicians from around the world recorded a piece of music. The interesting twist was the fact that all the musicians were located in different countries at the time of the recording. 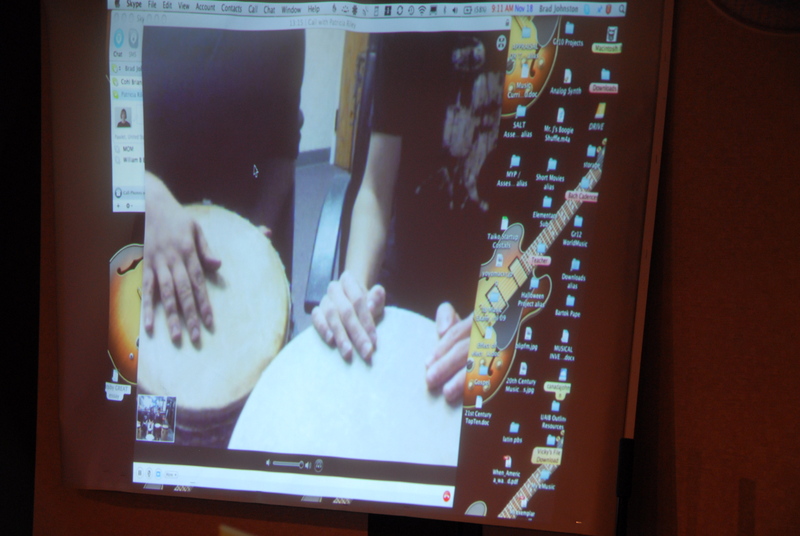 Using the technologies available musicians were faxed (it was a while ago) copies of music and then linked their studios together via teleconferencing. At the time I thought that it was very cool and that the future holds some real treats. The joining of talents from all over the world in real time and little or no expense. This is a very viable way of bringing in guest lectures and performers of a variety of expertise into your classroom. The possibilities are endless. Since starting a joint experiment with Patricia and the U of V music department I started looking for other tech savy and open minded music educators and musicians and have developed several interesting programs linking my music classroom to the virtual world of music. A great area to find contacts is to use the technology at our fingertips. Twitter and Blogging have both proven to be a great resource for finding new contacts as well as using the vast network of professionals I work with in the entertainment industry. The students enjoy the experience and it is very easy to set up and use. If you would like to discuss future possibilities please drop me a line via email. If you are interested in this project please watch some of the video footage from the telecast at the Vimeo pages found below. The first is using NoteFlight software to help teach grade 7 music students how to write a melody. The second is teaching grade 10 students how to play Djembe. Vermont Melody Project Web Version from Brad on Vimeo. Vermont TIME Djembe 2009WEB-desktop from Brad on Vimeo. Share Experts knowledge with your class – using skype and other online connection tools. Read this article on a previous post. If you are looking for other ways to connect for a teleconference other than using skype, check out Present.io It is a free online service, you do not have to download software and you can invite people to share a URL created. It can be private or public. More interesting is the fact you can also share pics, other files located on you hard disk. Or try “Wetoku” and “Vokle“.